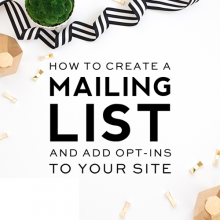 Part 2: How to create a mailing list and add mailing list opt-in boxes to your site. Part 3: How to dramatically increase mailing list subscribers and target your dream audience. There are endless excuses why people don’t have a mailing list. My excuse was always that I just didn’t have the time (can you relate?). I’m a full-time stay-at-home mom that runs a full-time business on less than part-time hours. Cramming everything this business requires of me into just a few hours a day has always been a struggle. I’ve had to learn how to really prioritize my time and, as a result, building a mailing list has always ended up on the back burner. Well, five months ago, my hubby and I adopted a beautiful baby girl who has significant medical needs, so it has limited the time I’ve been able to dedicate to Designer Blogs even further. I found it necessary to really step back and evaluate how to make the best use of my decreased work time. Since I have a very capable team of top notch designers I felt the best use of my time would be for me to step completely away from designing and finally focus my attention on email marketing, this blog, and building a better brand. That shift in focus has made all the difference in the world for Designer Blogs! Five months ago our email list was non-existent, which meant we had zero subscribers. None, zilch, nada! Since focusing on building our email list, we’ve gone from 0 to 10,000+ subscribers in just five months (I’ll teach you how we did this in part 3) and our list continues to grow by several hundred each week! Our sales and traffic have dramatically increased and I’m now banging my head against the wall for not focusing on building our mailing list sooner! 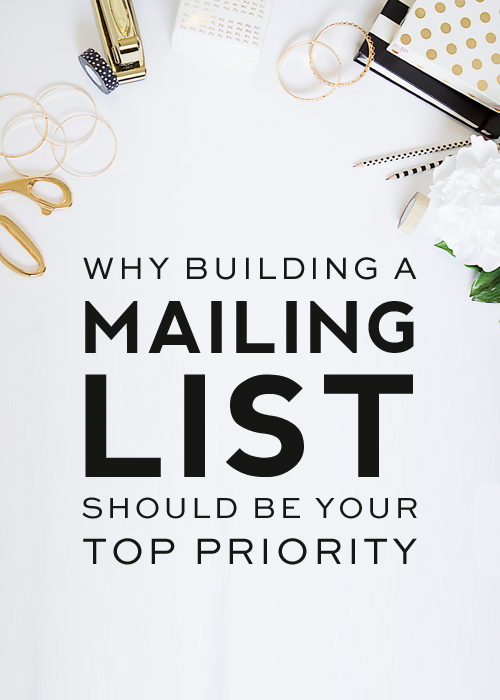 If you want to grow your business or blog, you absolutely MUST make building your email list your top priority. It needs to be an even bigger priority than building your fan base on social media. Think about how many emails you get in an average day. Maybe 50 to 100? Now think about how many social media updates appear in your various feeds each day. Several hundreds to thousands! You have a far higher likelihood of having people see, open, and click on your email newsletter than you do having them see updates you post on social media. It’s a lot easier to ignore a status update than it is to ignore an email in your inbox. People may not be looking at your blog or website every day, but they do check their email numerous times a day. As fabulous as your site probably is, it’s still not as important to people as their inboxes. 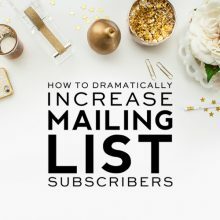 Having a mailing list helps you connect and build a personal relationship with your readers on an ongoing basis, which in turn, builds trust. You have no ownership over social media, which means they can change their policies and the reach your status updates have at any time (take Facebook for example). Having people on your email list keeps you in control and your exposure to your subscribers completely in your hands. You need to consider every person you acquire on your email list a potential customer. Marketing to them over and over again will build their trust and will (hopefully) eventually turn them into paying customers. Whether you realize it or not, your email list serves as a direct reflection of the energy and success of your business or blog. Hands down, building a targeted email list is THE most important thing you can do to grow a successful blog or business. Don’t put it on the back burner like I did. Put it at the top of your priority list and I promise you’ll start seeing the same amazing results we have. In part 2, I’ll teach exactly how to get a mailing list set up and opt-ins placed on your site so you can start growing your list fast! In part 3, I’ll teach you how to dramatically increase your mailing list subscribers and target your dream audience. Speaking of mailing lists, why don’t you take a second to join ours below and you’ll receive our Ultimate Blog Planner Kit absolutely FREE! We wanna to hear from you! What has been your excuse for not setting up a mailing list? Or, if you already have one set up, what successes have you seen from it? Let us know! 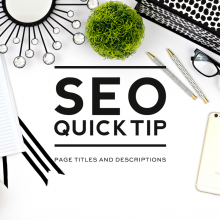 Optin forms, just today I learned are also called squeeze pages, as they serve to ‘forcefully’ extract the email addresses from the visitors by showing them a tempting carrot, some thing very vital in building up a sold subscriber list. With out a healthy mailing list no body can dream of making money through their blogs and build an effective social media exercise to enhance the traffic by manifolds. Looking forward to reading the rest of this series and finding out how to build up an email list of subscribers! Great post! Its certainly something i’m working on! I feel like I’m getting visitors, but I’m not converting them into email sign ups. Maybe my opt-ins aren’t good enough? I just made a lot of changes recently so maybe thats why. I don’t know. I suggest promoting your free opt-in like crazy around your site. If you find you aren’t getting many sign ups, then maybe it’s time to re-evaluate or fine tune your opt-in. You may need to try a few opt-ins until you find one that converts. Hope this helps and good luck! Hi! Thank you for this post, creating an email list has been on my to do list for a while but this was the necessary kick up my backside! I was just wondering what you send out to your email list. Do you notify them of each new post or do you send a round up? Do you write new content for your emails?